Clearly a chic choice. The Olivia table lamp wows with understated elegance. 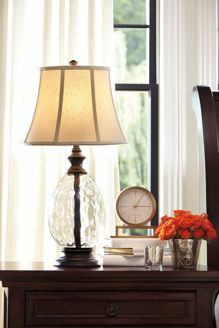 Light amber-shaded glass is enhanced with a dark oil-rubbed bronze base. Faceted glass base in a teardrop design adds rich texture and a splash of drama. Graceful bell-shaped shade is a curvy complement.